I just exported / copied a virtual machine from one of our servers (a HP Proliant) to my laptop so that I could to mess around with it offline. I used the following commands to export the domain. You can also view the same information using virsh capabilities command. It is worth piping it through less because the command produces alot of output and the host cpu information is at the top. So, to fix the issue, I just edited the domains xml definition and put in the correct features. Note – if you are using ubuntu on your desktop and have virt-manager installed (which is an awesome gui application which runs on Linux and Macs). 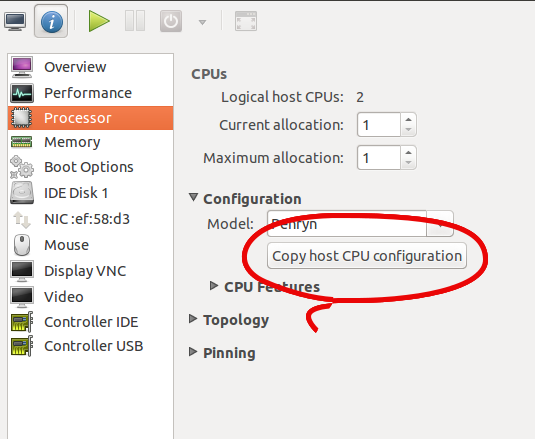 You can run virt-manager, open the virtual machine, go to the information tab, select the processor and then “copy host cpu configuration”. I’ve attached a screenshot of how to do this. Nice HowTo. It saves my time! Thank you so much! You actually saved my practical exam. I was panicking because I could not run the VM. Ubuntu 13.04 – kvm binary is deprecated?